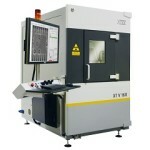 The XT V 130C is a highly flexible and cost-effective electronics and semiconductor inspection system. 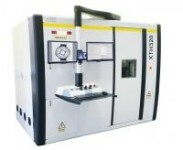 The system features a 130kv/10 watt Nikon Metrology manufactured source, a globally recognized open tube design with integrated generator, and a high-resolution imaging chain. The XT V 160 has been designed to cater to the need in production lines and failure analysis laboratories. Equipped With precision joystick, users can easily control the 5-axis sample manipulator. Real-time X-Ray allows them to intuitively navigate complex printed circuit boards and electronic components and quickly trace defects. 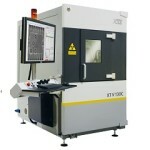 XT V 160 NF is a high-precision, flat-panel based X-ray inspection system that facilitates real-time imaging and defect analysis of next-generation wafer-level, semiconductor device and PCBA applications. The XT H 225 ST is a Computed Tomography (CT) system ideally suited to a wide range of materials and sample sizes, especially those that are too large or heavy for other systems in the range. The XT H 320 features a more powerful microfocus X-ray source that is able to run highly accurate inspection on dense industrial objects. The XT H 450 system offers the necessary source power to penetrate through high density parts and generate a scatter-free CT volume with micron accuracy.